Colorado’s Rocky Mountains with snow among Pine trees. If you’re new to Rocky Mountain National Park (RMNP), take a minute to plan your visit. The National Park Service (NPS) enlightens us on what you can expect, and what to do throughout RMNP. Also, feel free to view the NPS’s many brochures for further information and guides. Enjoy your stay! Oh, and if you’re not sure where to go or what to do, take a look at the National Park Service’s Places To Go and Things To Do pages. Learn about RMNP’s hiking trails, picnic areas, scenic drives, and more. Learn about the rules and regulations of RMNP on the National Park Service’s Rules & Regulations page, including information about camping, pets, cycling, fishing, wildlife, hiking, and more. Follow the rules to keep Rocky Mountain National Park a national gem! The park is open year round, so long as the weather permits access. Learn about RMNP’s hours and accessibility status throughout the changing seasons. Take advantage of the glory of Rocky Mountain National Park all year — and don’t forget, you can get a year-long pass for $60! The Rockies are a wild place, and things change quickly up at altitude. Take a look at current conditions in the park, including the current weather, trail conditions, road conditions, and more — jump over to the National Park Service’s Current Conditions page to read updated statuses for your visit. Plus, you can take a look at live webcams that are scattered throughout RMNP! Be sure to plan ahead for your trek into our national park! Want to reserve a campground? Or curious about backcountry camping? Read up on information and make a reservation on the National Park Service’s Permits and Reservations page. You can also learn about permits for filming, special events, weddings, and more. Reservations for camping go especially fast in the summer, so reserve a campground early! Dream Lake at the Rocky Mountain National Park, Colorado, USA. As we’ve mentioned, the weather changes quickly up here in the Rockies. Monitor the current weather around the park on the National Park Service’s Weather page. You can view the current weather conditions in Estes Park, Grand Lake, and at the Alpine Visitor Center (which is near the top of Trail Ridge Road). Also, read about the general climate in the region, as well as the changes you can expect to see throughout the season. 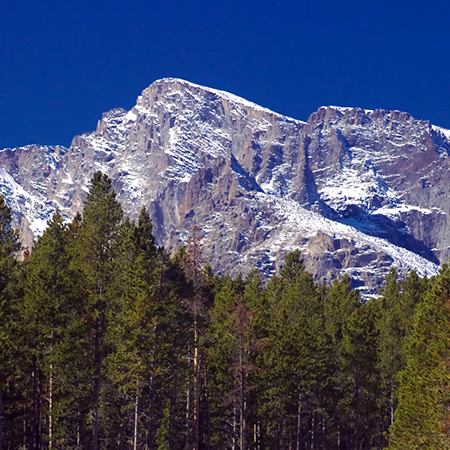 Rocky Mountain National Park has long been a tourist attraction of epic proportions. As such, the park has grown to welcome more and more visitors, and it now provides all of the amenities you could need on a visit. Learn about nearby stores, guided tours, and more from the National Park Service’s Goods & Services page. If you’re looking for lodging near RMNP, stay with us here at Rams Horn Village Resort — we’re minutes away from the park entrance, and we provide premier, luxury cabins for visitors from around the globe. Curious about upcoming events in the park? 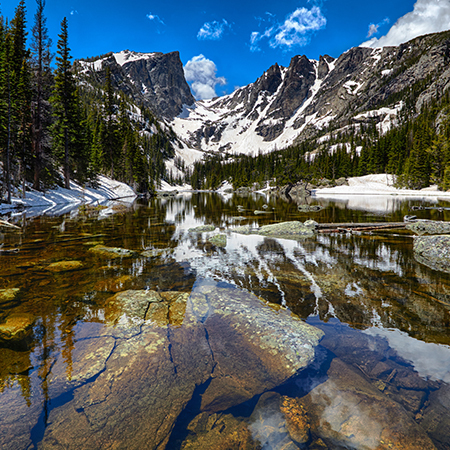 Take a look at the National Park Service’s RMNP Calendar. There’s usually something going on around Rocky Mountain National Park, especially during the warmer months. Try hiking with a ranger, learn about mammals in RMNP’s Skins and Things event, or take a Twilight Walk. 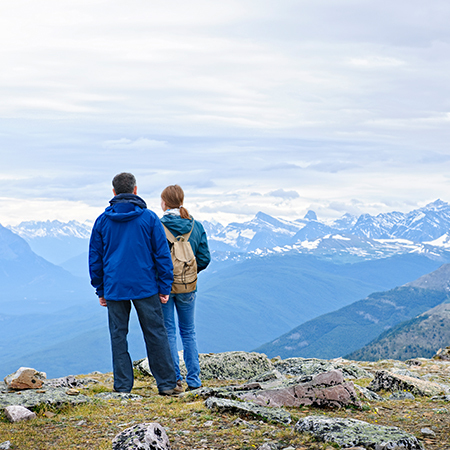 Hikers enjoying scenic Rocky Mountains view. The park is beautiful, but it can be dangerous. Be wary of wildlife, Mother Nature, and other hazards. Take precautions and read the National Park Service’s Safety page to gain knowledge about various dangers around the park. Also, take a moment to learn about wheelchair accessibility in the park, as well as information on disabled parking and more on the National Park Service’s Accessibility page. News: The park is constantly changing; keep up with the latest news and information from the National Park Service. Media: View photos, webcams, videos and presentations, and podcasts from various sources all on the National Park Service site. History & Culture: Humans occupied Rocky Mountain National Park 11 millenia ago, and the park’s written history contains well over a century of information. Learn about the history of the park and the culture in which we live. Nature: Curious about the environment in RMNP? Want to learn about this unique habitat and its inhabitants? Take a look at the NPS Nature page. You’ll learn about plants, animals, and our unique ecosystem (and much more!). Science: New discoveries are the norm in the park, and research is a constant. Learn more about current projects in the park, get involved, and learn some science from the National Park Service’s Science and Research page. Information for Children: Have curious kids? Browse the National Park Service’s For Kids page to view kid-friendly information about the park. Fire Information: Wildfires pose a serious threat to the flora and fauna here in RMNP. Learn about wildfires, fire management, and fire safety here in the park from the National Park Service’s Wildland Fire page. Rockymountainnationalpark.com: View trails and maps throughout the park. You can also learn about things to do in the park, the best ways to get around, and how to plan your RMNP trip. Estes Park’s RMNP Page: Learn more about RMNP, and connect with Estes Park. On the Estes Park website, you’ll find information about Rocky Mountain National Park, as well as the amenities and attractions that you’ll find in Estes Park. View photos, learn about adventures and activities in the park; find favorite camping locations; get educated about the local wildlife; and learn local insight from RMNP’s nearest neighbors here in Estes Valley. The National Park Foundation’s RMNP Page: The National Park Foundation operates in collaboration with the National Park Service in order to provide support for national parks across the country. Visit the RMNP page to gain some insight into where to go and what to expect during your visit to the park, and discover how folks are making an impact through volunteer efforts, research, and education. Now that you’re familiar with the terrain, it’s time to book a stay here at Rams Horn. We’re one of the closest resorts to the entrance of Rocky Mountain National Park, and we provide unbeatable amenities and luxurious cabins. You can absorb the full beauty of the park with all of the comforts of home (and more!). Check cabin availability today!